This handcut sterling silver feather is accented with a cross as the quill. 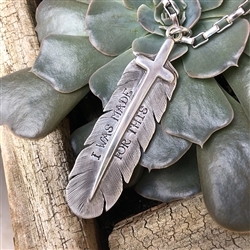 It is hand-engraved and stamped with the words "I was made for this." It can be stamped with up to 20 characters.